These bulbs are to be installed in C7 cords that can be purchased separately. Choose the socket spacing of your cord based on the size of your project. 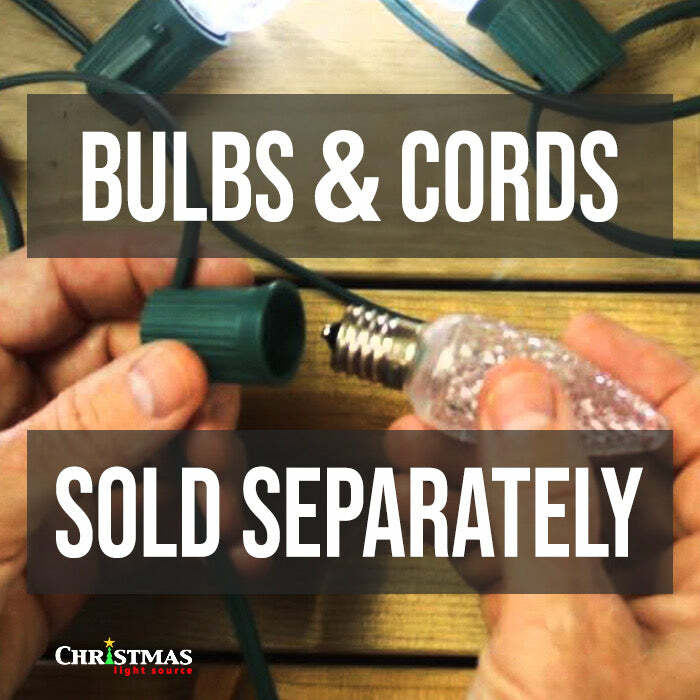 Bulbs and cords are sold separately at Christmas light Source allowing you maximum flexibility when choosing colors, shapes, and finishes. Bulbs are shipped in boxes or bags and cords are shipped with their sockets installed on 20 or 18 AWG wiring ready for you to install your bulbs. Give each bulb a counter-clockwise turn before turning clockwise to avoid cross threading. We have one of the widest selections of C7 cords and spools to choose from if you need to purchase new stringers - you can coordinate with your decor with either green or white wiring.